Finding an office to launch my business from was one of the first decisions I had to make in 2014. Many people suggested I start with an office in my home. With a small house and two kids under the age of three, I knew that wasn’t a wise decision. After meeting with a real estate broker about some video projects, the topic of office space came up. Eric Malmberg, the broker for RE/MAX Advantage Plus, told me he had extra office space in Minnetonka that I could use for free. I thought the offer was too good to be true. I barely knew this guy! Eric talked to me about how he started his business and had others who helped him get things launched. He wanted to “pay it forward” by helping me out with office space as I got started. I stayed there for the first 18 months of business. It was sort of like my arrangement after moving home from college. No rent, no internet or utility fees, and completely furnished. A pretty sweet deal. This worked out great until business grew to a point that I needed more space. 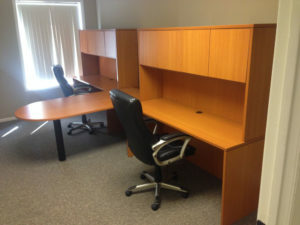 There was room for two desks in the office and I was ready to have a team of three. It was time to move. In June 2015, we found office space in Eden Prairie. A friend connected me with someone who was in the same situation as us – a small, but growing business…and not a lot of money to put into monthly lease payments. We found an 1,800 square foot office space in the lower level of a building that had been sitting vacant for more than a year. We got a really good deal on rent and “cohabitated” for the next two years. It was sort of like moving into a new place with roommates. We had our space, they had their space. Rent and other expenses were split among us and it was a great arrangement. 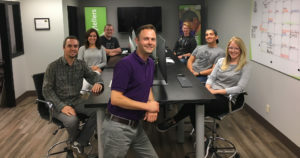 One person had a website development company and another had a graphic design company. We were able to trade some business back and forth and had a lot of fun along the way. Business continued to grow, however, and I needed more room for people and equipment. In June 2017 I made the decision to move into our own space. After looking at many locations, I found one in Golden Valley that was in the area I wanted. However, the space wasn’t in usable condition. As you can see in the photo, it was in rough shape before we moved in. We’ve been able to make this space our own. We fixed up the walls, ripped out the carpet, and replaced some broken glass. 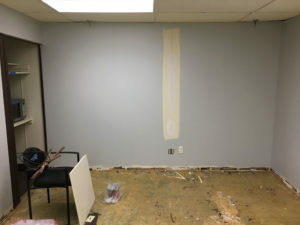 After 3.5 years in business, we finally had our “own” space where we could paint the walls whatever color we wanted and crank up the music without upsetting anyone. Part of the excitement for an entrepreneur is the journey, and we’ve come a long way in three years. We’ve moved from a small two-person office to nearly 2,000 square feet of office space. While I don’t think this is our “forever home” it is working great for us right now. Both of our previous moves have been in the month of June, and while we’re not moving anywhere this year, the month of June allows me to look back and appreciate the progress that has been made. I’m proud of how far we’ve come, and I’m looking forward to new ways to fuel the future. And I don’t even have to pack any boxes, yet.